Welcome to Agrabah, City of Enchantment, where every beggar has a story and every camel has a tail! All of your favorite characters are here in Disney’s Aladdin JR, a stage adaptation of the Disney hit film. 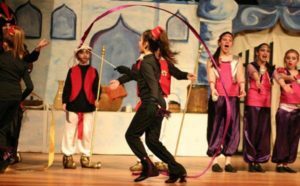 Filled with magic, mayhem, and flying carpet rides, audiences’ spirits will soar with excitement. 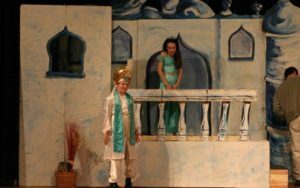 Most of all, the tuneful, Academy award-winning score with songs including “A Whole New World” and “Friend Like Me” will certainly make this musical a favorite for many years to come! Disney’s Aladdin JR is presented through arrangement with Music Theatre International (MTI). 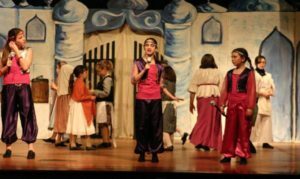 This program is supported in part by grants from the Easton, Foxboro, Franklin, Mansfield, Norfolk, Norton and Sharon Cultural Councils, local agencies which are supported by the Massachusetts Cultural Council, a state agency.